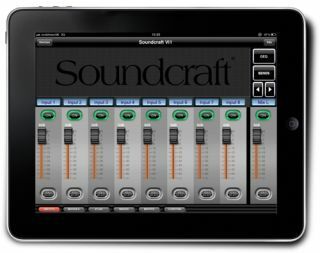 Prolight & Sound 2012 marked the unveiling and preview of the new HARMAN Soundcraft ViSi Remote iPad app, which enables a single iPad to control multiple consoles from the Soundcraft Vi Series and Soundcraft Si Compact range on one wireless network. The Soundcraft ViSi Remote app allows users to roam around in a venue and not only adjust input channel levels and mutes, but also adjust aux send levels and matrix sends, and level and graphic EQ settings on bus outputs. The app uses HARMAN’s HiQnet architecture to connect a network of consoles to a wireless router, which communicates with the iPad. Multiple iPads may be used on the same network, even on the same console, so that individual artists could control their own monitor sends, for example.